Hong Kong's mighty skyscraper skyline and bustling harbor traffic are on full display from Victoria Harbour, sandwiched between Hong Kong Island and Kowloon. Take in the city sights or dine on the water with a harbor cruise—here are your options. Get the best views of Hong Kong's daily Symphony of Lights show. Enjoy dinner or cocktails on the water with views of the Hong Kong skyline. 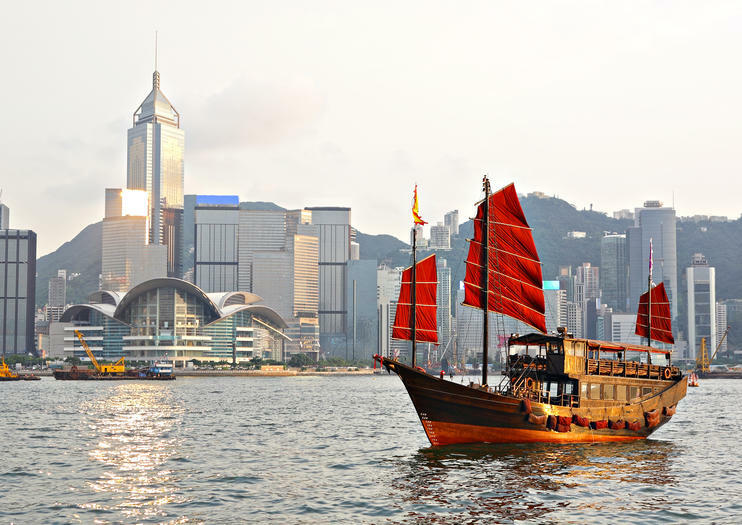 Learn about Hong Kong's history and distinctive neighborhoods onboard. Tours combining a cruise with a sightseeing tour of the city are available. Most cruises last 1 to 3 hours. Each evening, the Hong Kong skyline illuminates during the Symphony of Lights, and one of the best places to watch the colorful spectacle is from the waters of Victoria Harbour. On National Day (October 1), it's also possible to catch a fireworks display on a night cruise. It's no secret that Hong Kong is a foodie paradise, and while there's no shortage of excellent places to eat, there's something undeniably romantic about dining on the water. Choose to eat onboard the boat, or opt for an evening cruise followed by dinner at Victoria Peak or Hong Kong's famous Jumbo Floating Restaurant. As one of Hong Kong's most popular activities, a harbor cruise can easily be combined with an afternoon of sightseeing, a drive to the top of Victoria Peak, or a post-cruise stroll through the popular Temple Street night market. Enjoy a memorable evening of city skyline views, delicious food and unlimited drinks during this Hong Kong Harbor night cruise and dinner at Victoria Peak. You’ll stroll through the Temple Street Night Market in Kowloon, relax on the waters of Victoria Harbour and savor a traditional meal atop Victoria Peak. Pickup and drop-off is included from select Hong Kong hotels. Enjoy the beauty of this glittering city at night during a sunset dinner cruise on Hong Kong’s famed Victoria Harbour. Delight in a seven-course Chinese banquet at the popular Jumbo Floating Restaurant in the fishing village of Aberdeen. Sip unlimited complimentary drinks from the open bar as you cruise through scenic waters on a traditional Chinese sightseeing boat. End with a stop at the midpoint of Victoria’s Peak, where stunning panoramic views make for picture-perfect photographs. Spend an unforgettable night on the water with this 3-hour dinner cruise and light show experience. Get picked up from your Kowloon hotel, and board a boat for a nighttime cruise around Victoria Harbour. Watch ‘A Symphony of Lights’ — a 10-minute light and laser multimedia show where more than 40 buildings along both sides of the harbour light up. Also, enjoy a buffet dinner and views of Hong Kong as you travel. Combine a cruise on Hong Kong's Victoria Harbour with a trip up to the top of Victoria Peak on this nighttime tour. See the city skyline lit up for the night while listening to insightful commentary from a guide and enjoying unlimited drinks on the cruise. Sit down for dinner at Bubba Gump, during which you can snap photos and enjoy views, then head back down to town to peruse the goods on offer at the Temple Street night market. Enjoy sunset or nighttime views of Hong Kong Island and Victoria Harbour from the water on a 45-minute evening cruise. While you admire the city skyline light up for the night, sip an included beverage on board and soak up the fresh air from the deck. Select from several departure times when booking. Pack in tons of city sights all in one day with this 8-hour sightseeing tour of Hong Kong, including a buffet dinner cruise and hotel transport. Ride the tram up to Victoria Peak and stop by landmarks, such as the Old Clock Tower. Then, at night, hop on a ship for a buffet dinner cruise along Victoria Harbour, and watch ‘A Symphony of Lights’ illuminate the surrounding city. Experience the beauty of a stunning Hong Kong sunset as you float across the harbor enjoying unlimited drinks on this pre-dinner cruise. Spend an hour adrift on open waters, past sparkling city skylines and pristine coastal views. This evening escape is not to be missed. Celebrate National Day this October on a firework cruise in Victoria Harbour. Set sail from Sai Wan Ho Ferry Pier, cruise the water, and take in sights of the surrounding area illuminated at night. Plus enjoy unlimited drinks and a firework show during your time on the boat.